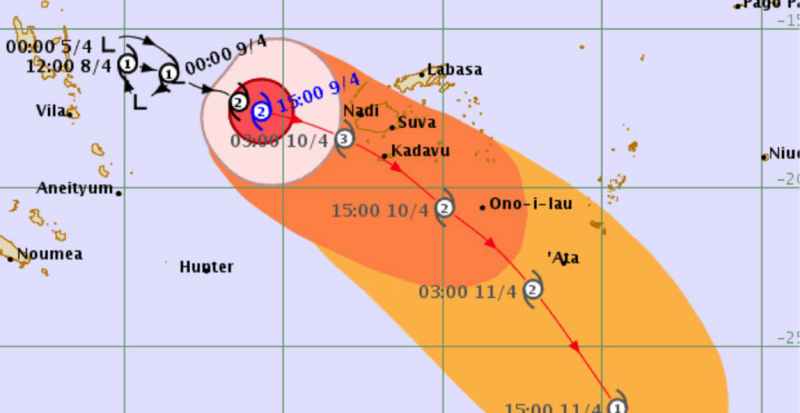 The islands of Fiji and several other nations nearby recently faced the wrath of Tropical Cyclone Keni. A powerful Category 3 Cyclone, TC Keni in its wake left several infrastructures, houses and vegetation damaged by bringing in heavy rain and winds with speeds between 130 to 185 km/hr. The cyclone crossed into Fijian waters on the 10th of April and amongst the most badly affected areas were the southeast side of Viti Levu, Mamanuca group, Kadavu, Beqa, Ono-i-Lau and Totoya island. Pacific Flying Lab together with the Fiji Red Cross, were one of the first organizations to respond to and conduct damage assessment on the island of Kadavu which was severely damaged during the cyclone. A team of 4 were deployed on the 12th of April to the island which is south of Suva City via helicopter since the islands wharf and jetty were partially washed away. The island of Kadavu falls under the Kadavu Province and after the cyclone, it was cut off from the main land for days with no electricity as communication towers and power lines were badly impaired. Storm surge had ruined supplies at local grocery stores and exposed the foundation of houses and the roots of large trees. Several large trees gave way under pressure with one completely blocking a road and crushing a home in Namuana, Vunisea. Fallen tree blocking the road between Namalata and Namuana village. Prior to the cyclone, Fiji Red Cross had set up their Vunisea office together with a container full of relief items ready for distribution. Relief items included clothes, water purifying units, blankets, tarpaulins and tools for repairing homes. Distribution of these relied heavily on knowing which households needed help the most thus getting information on ground regarding the number of households, damage done and number of people per household was vital and it was imperative that none of the households were left out. A damaged house in Namuana village with only the foundation intact. Despite the constant power and network disruptions, the team were able to map out the village of Namuana using a Phantom 4 Pro drone, conduct on foot surveys on both Namuana and Namalata and distribute relief items to more than 70 households in the span of just 3 days. The team worked closely with the government officials and were able to report back to the main island in a timely manner for more relief items to be brought in. Apart from network and electricity disruptions, strong winds and the location of villages close to the local airstrip on the islands of Kadavu made it difficult to work. Strong winds often took the drone off its flight path, making it difficult to get proper images and footage while the village of Namalata was only surveyed using traditional pen and paper method as it was too close to the airport. Editor’s note: By deploying with the Fiji Red Cross last month in response to Cyclone Keni, Amrita Lal became the first local drone pilot to be formally engaged in disaster response with a National Red Cross Society in the South Pacific Region.